يشكل فندق Quality Suites Crest Mandurah بموقعه الممتاز في منطقة مطاعم, شواطئ, سياحة ضمن مدينة ماندوراه، مكاناً ملائماً لقضاء العطلة بعيداً عن عجقة أيام العمل. يمكن من هنا للضيوف الاستمتاع بسهولة الوصول إلى كل ما تقدمه هذه المدينة النابضة بالحياة. يضفي محيط الفندق اللطيف وقربه من ‪Dolphin Quay‬, ‪Mandurah War Memorial‬, The Candy Shop سحراً خاصاً على هذا الفندق. استمتع بالخدمات الراقية والضيافة التي لا مثيل لها بهذا الفندق في ماندوراه. يمكن لضيوف الفندق الاستمتاع بالميزات التالية على أرض الفندق: مرافق مخصصة لذوي الاحتياجات الخاصة, تسجيل وصول/خروج سريع, تخزين الأمتعة, صف السيارات, التوصيل من وإلى المطار . 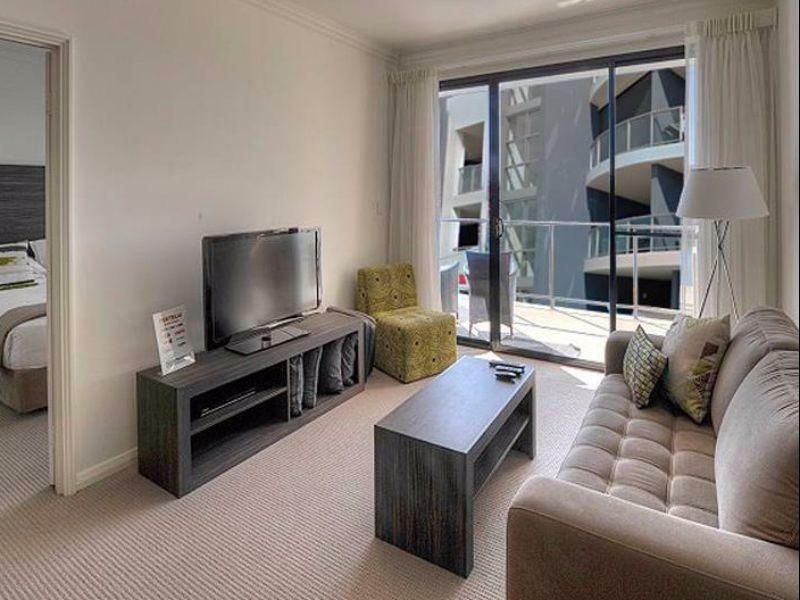 في Quality Suites Crest Mandurah غرف نوم يزيد عددها عن 56 صممت بذوق وعناية لتوفر لك كل وسائل الراحة . بعضها يحتوي أضاً على تلفزيون بشاشة مسطحة, غرف لغير المدخنين, مكيف هواء, تدفئة, مكتب. يقدم الفندق خدمات رائعة كمثل شاطئ خاص, مسار جولف - ضمن 3 كم, صيد السمك, ملعب للأطفال لمساعدتك على الاسترخاء بعد نهار طويل من النشاط والتجوال في المدينة. مهما كانت دواعي سفرك فإن Quality Suites Crest Mandurah هو خيار ممتاز لإقامتك في ماندوراه. This is a very welcoming apartment. The layout does a great job of bringing the magnificent setting into the lounge here. Views of the quays are stunning morning to night and that;s just the views. The apartment was spacious enough with very good amenities. The only thing that would have improved it would be the addition of a pool. There is a beach adjacent to the property tho so I'm being rather pedantic. What can I say? I LOVED this apartment so much my wife and I discussed living here once our kids have flown the nest. Simply stunning! Dolphins right next to your apartment. We saw a whole family of dolphins just at the bridge next to the apartment. No need dolphin tours at all. Moreover, there's reserved underground parking, in-room free laundry. Love the new and clean rooms, totally worth it. Not forgetting it has restaurants just at level 1, cinema a street across and the famous Cicerellos a free blks away. We were here 1 year ago being the last night of our vacation. It has impressed us so much then that this year's vacation, we made it our first stop. Although there is a change in management, the standard of the place has not deteriorate one bit. The apartment is spacious, and new; come with washing machine and dryer that help us a lot. Basement car park is secured, and can get good food nearby. Only setback is air cond is only in Living Room, it is a little uncomfortable for 2nd room whose window is just on the corridor. WISH WE COULD STAY LONGER. THOUGH NOT MUCH OF SERVICE COS NO FRONT DESK WHEN WE ARRIVE (KEYS IN A SAFE @ THE ENTRANCE) NO HOUSKEEPING. IT'S AN APARTMENT. IT'S MODERN, NEW, SPACIOUS AND SUPER COMFY. RESTAURANTS ARE JUST DOWNSTAIRS. DOLPHIN TOUR IS WALKING DISTANCE. NICE VIEW OUT TOO. IT'S SO SELF CONTAINED. Location was great. We didn't feel the room was worth its price. The room we were in was in need of maintenance. If we were planning on staying longer than the few days we did we would have asked for another room. The Room was not as clean as expected. The Bathroom basin bowl was brocken, glass shower screen didn't work properly and was not safe. toilet seat brocken. The staff are hit and miss. We had a lovely staff member that greeted us on arrival but speaking with other staff in reception was not as pleasant. We would come back if we got a better room and at a very good discounted price. 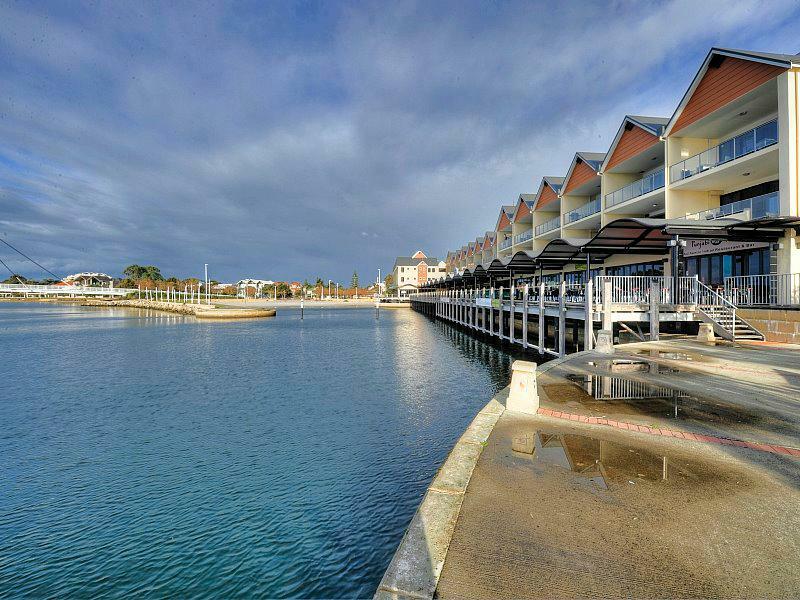 Conveniently located at the quay and marina; restaurants, shops, and beaches very nearby. We stayed in a one-bedroom apartment, which was clean and quiet, with all the necessary efficiences. It's a good base for exploring the area, or en-route to Margaret River. Strange smell upon entering apartment. Not sure if it was chemical from carpet clean?? Other than that we were very happy with apartment. The sound insulation was excellent. Was very quiet at night. Cleanliness was excellent too. Maybe price could be bit lower for Palladio apartments. A good, clean and modern apartment with private parking underground and remote control to open the gate. Kitchen is great, complete with microwave, stove and utensils. Both rooms has their own nice and comfortable bathroom. Good location with reasonable price. The condition and cleanliness of the room is great. Good to have washing machine and dryer in the room too. We enjoyed the convenience of the location- short walking distance to restaurants and shops. The Oyster Bar at the hotel is a good place to chill out too. We were delighted on the condition of the room. It is very clean and comfortable. It has everything we need. 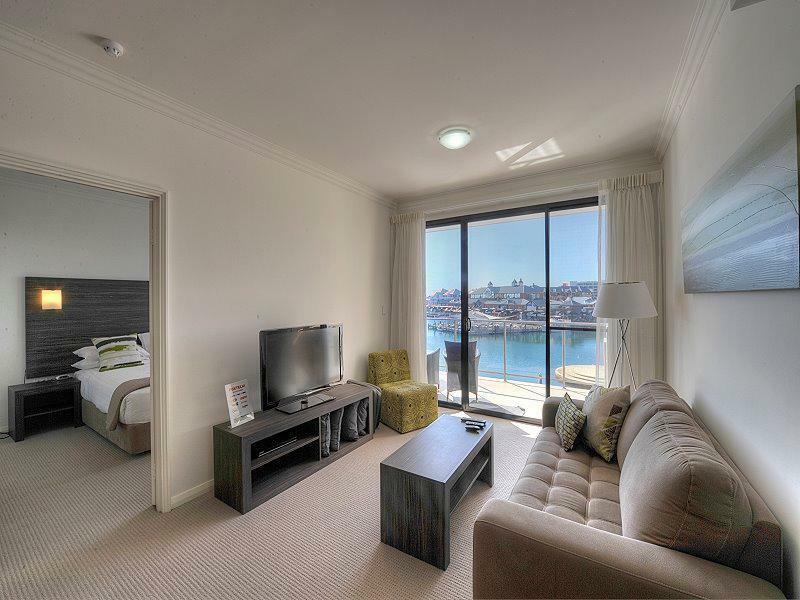 Nice and bright apartment in a good location opposite the beautiful dolphin quay. Everything looks new. Seems to be refurbished/ renovated recently. Well equipped for cooking. Stayed in the 2 bedroom apartment. In the bedroom with 2 single beds, the single bed is too small for comfort. The window blind is not able to shield the strong light from the corridor completely. Have difficulty sleeping on the bed near the corridor window. A curtain instead of blind would solve this issue. I think this place is a death trap. One only lift for the whole place and stairs situated at the end of each section. No way could this be safe for fires or other disasters. I can’t believe this has been passed by the council for safety regs. On arrival the room was great! That night the air conditioner was very noisy & kept us awake but the room was too warm not to have it on. When we reported this to reception she barely looked at us was unfriendly & uninterested. We asked to swap room as maintenance couldn't make it to look at the air con. Our room was swapped & the air con in that room dripped water. The reception could do with some customer service training as it was extremely poor service and really let it down. overall was good, but one of the rooms which we stayed out of gas for barbecue. No staff at the reception counter at night. It shall be checked by the staff prior to our stay. Fully functioned, clean, modern, well located apartment. We stayed there for five nights, and we’re really happy with the facilities in the apartment. Will be back again for sure!! Quite a number of restaurants and bars downstairs open till late. We are from Perth, this is a short getaway family trip to Mandurah. We love this place. The unit was big and spacey and surrounding was great for a relax family weekend.